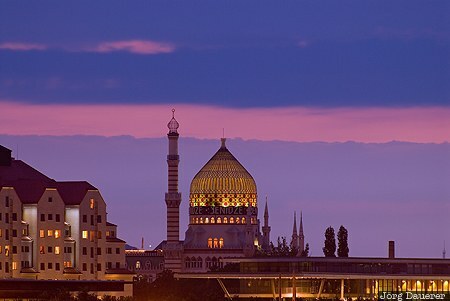 The glass cupola of Yenidze a former cigarette factory building Dresden in front of a colorful sunset sky. Dresden is the capital of Saxony (Sachsen) in the east of Germany. This photo was taken in the evening of a rainy day in June of 2009. This photo was taken with a digital camera.